A 55-year-old man with Marfan syndrome taking warfarin for anticoagulant therapy after aortic valve replacement developed acute kidney injury (serum creatinine level of 9.01 mg/dL) and gross macrohematuria. Renal biopsy showed red cell casts in the renal tubules, glomerular crescent formation in the glomeruli with immunoglobulin A deposition, and global sclerosis. 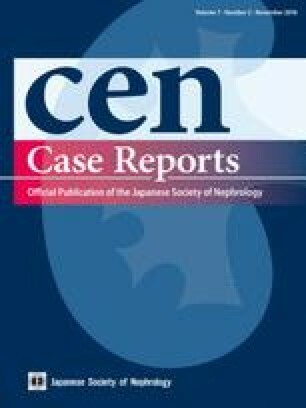 Based on these findings, the patient was diagnosed with warfarin-related nephropathy with acute kidney injury characterized by immunoglobulin A nephropathy with crescents. The warfarin was withdrawn, and his hematuria and renal function improved without immunosuppressive agents. Informed consent was obtained from the patient in this case report.